Yummy curry...love the sweetness of the vegetable..
nice recipe and i am big fan of rajks kitchen and she is a very good friend of mine. U have a nice blog with authentic dishes too. 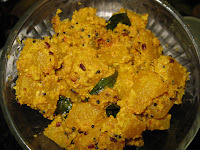 Pumpkin curry looks fantastic Vidhya, i have bookmarked few from Raks's blog, yet to put my hands.. This is how my MIL makes this thoran. It tastes delicious!